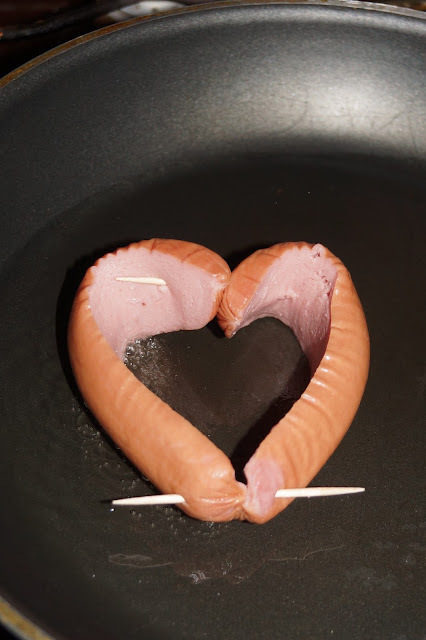 Sausage cut in half, but not completely.Fold into the heart. Fasten ends with toothpicks. Сосиску разрезаем пополам, но не до конца. Сворачиваем в сердечко. Концы закрепляем зубочистками. Pepper and herbs to taste. omg they are so adorable and delicious! can't wait to try them! Отличный завтрак ко дню Св. Валентина! Ooo, that is so cute. Have a great day. Oh this is really nice... Thanks for sharing! Happy Heart's Day! Awww this is so cute! Too bad this will be a wknd breakfast since I am busting out the door in the a.m. To get to work. How cute is that? If only my kids would eat sausage and eggs.. hmmmm... :) Following you back, thanks! какая предесть! я попробую обязательно! Gorgeous! I am so doing this tomorrow for my boyfriend! wow this is so creative and romantic! in my country breakfast isnt usually salty, but i would definitey try ir for dinner! cute blog, would you like to follow each other? let me know and i'll definitely follow back! totally adorable and so very cute!! followed u back already sweetie!! Какая прелесть! Лена, ты просто чудо мама! А я изверг, у меня дети едят кашу и творог с утра и точка!!!!! Buenas! me ha encantado tu entrada y también tu blog.